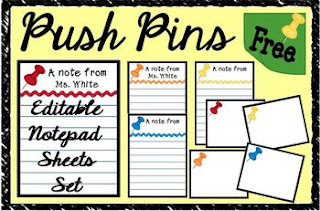 This collection of Push Pins Notepad sheets is a sure way to brighten your day! Your special teacher will love this elegant and stylish gift, whether jotting notes at school or using in their home office or den, they will make note-taking fun. A creative and practical gift that any teacher will not only appreciate, but will actually use! They will make perfect end of year gifts for your colleagues or a welcome gift for a new teacher. The set is editable; and features four colorful push pins with coordinating ribbons. You can personalize with your name or your recipient’s name; which can be changed whenever you are ready to print a new set. A set of directions is included with the download. There are two different sizes in the set. The first set measures about 6.5 x 4.5 and fit two per sheet. The second set measures about 3.5 x 4.5 and fit 4 per sheet. The notepad sheets can be used over and over again; just print and cut and you have a perfect useful accessory for your desk. This method makes it affordable because you can save and print the file whenever you need it...you'll have a lifetime supply of notepad sheets!! You can print how many you want, place in a pretty box or bag, and tie with a decorative ribbon for gift giving. Be sure to download the preview for an up-close view of all the sheets. Please check my store for other notepad sheets sets. Thanks for downloading and please let me know what you think.